School House Rock for MBA students. On corporate platitudes and white-shirt attitudes. What a beautiful summer day it is out there, eh? While I am cognizant that I have shared this audio feed via other channels and venues, this is consistent with my strategy of leveraging and repurposing existing investments in core assets in order to maximize returns due to my ongoing concerns of diminishing high-level ROI returns and increased liabilities. We must plan, model, marginalize, strategize, and methodoligize in order to minimize risk while leveraging both our tacit and explicit knowledge. In our efforts to create delightful user experiences and bring the wow effect to a maximized audience by creating delightful user experiences and seamlessness of our superior ecosystem assimilation, we will expand the ease of use and readability of demographic behavioural patterns in order to build our brand while minimizing sub-brand dilution and bringing delightful user experiences to the end user consumer end user. Team work is vital so we will break down the silos, build high-performance care teams, and reach across the table in order to innovate, productize, inventilize, ideaate and colorize. We will transition beyond our firefighting mode and uncover hidden gems. Yes, our sentences will run on but we can verbalize both our nouns and adjectives in order to weightify and codify our internal core messages while simultaneously delighting the key customers through relationship building and rapid productization. We must be laser focused on our KSPs, SKUs, ASPs, and most importantly, EVPs. In the developing form-factor cage match between looped and squared, Apple may have chosen to step into the ring with round. At least according to some leaks from the East. I am also putting my money on circular. It looks like circles are cropping up all over the place now. News ReCap: Home Land. From Apple to ZigBee, the smart home is smokin' hot. "The smart home is just around the corner." Many of us first heard that back in the year 2000. But now we really are about to arrive. If you're looking for the sizzling hot trend courant, sit back and relax, and don't leave home, because you're soaking in it. No, this stuff never happens overnight. From Microsoft and Samsung to Sony and Cisco, every influential IT and CE vendor worth their popcorn salt had mega stands at all the mega shows, demonstrating their vision of the connected home of the future. And the future is almost now. Microsoft, Apple, Amazon, Google, Samsung, Qualcomm, Cisco, Belkin and many other are getting ready for the beyond-the-PC world. Objects are connected, they learn, the improve, they are really rather smart and helpful. So, the news this week is full of hints and hot rumors of moves for the living room. Microsoft may be about to rollout a ChromeCast-like device. Apple is preparing a smart-home platform. LG and Samsung are now in the connected light bulb business. (I'll write another post about ReCap's new Smart Bulb report with forecasts to 2019. Thanks for the input on that one.) Let's not forget the service providers: AT&T, Verizon, your local cable guys, your power company, and security firms. Trends this big require a generation shift to be absorbed. A decade or two to work out the kinks. And a few spec battles just to make things interesting. As is usually the case in new markets, there has been first-mover advantage at home. But now it's looking like it's time to move in for real. Find your place or prepare to be locked out. Welcome home. 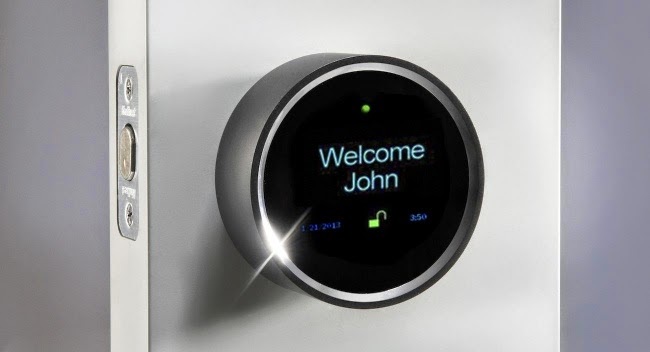 Goji Smart Lock. Please kick mi. Adidas's connected, sensor-filled miCoach Smart Ball. Key trends: the internet of things, sensors, well-being, playful, fitness, wireless charging. Perhaps you can forget the Wii when you have the mi. This looks like a great way to get the kids out of the house. Check out this product from Adidas: the miCoach Smart Ball. Yes, you have the smartphone, smart home, smart watch, smart clothes. And here comes the smart sporting equipment. In this sensor-filled world of the internet of things, we can count calories, we can count steps, so why shouldn't we be able to count kicks? Adidas's miCouch Smart Ball connects to the user's smartphone via Bluetooth as uses sensors and software to monitor kicks, and includes some games which cross the real world with the virtual one. And for a touch of additional coolness, it uses wireless charging. 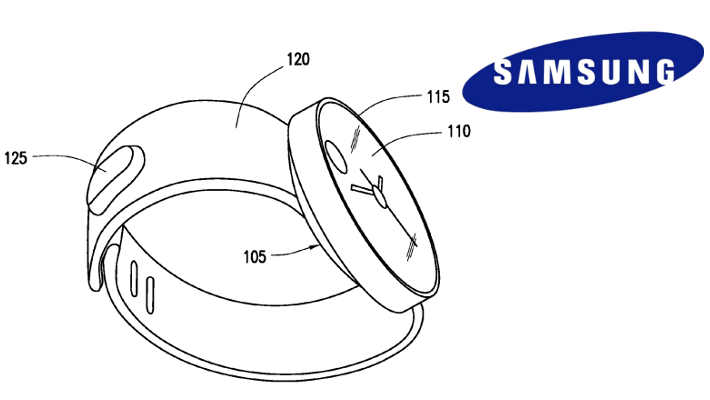 We'll be seeing a lot more solid uses for wireless charging going forward for sealed gadgets like this. The miCoach costs around $299/€299 in America/Europe. So, not exactly a toy. Is the smart watch market about to go full circle? Will one form factor prevail? So, how is the market for wearables shaping up? Is round & retro the new flat & black? Predicting consumer tastes is always the hard part. Let's look at the market for smart watches. Though connected watches have been around for more than a decade from vendors such as Sony Ericsson and Polar, they never caught on as mainstream accessories. If I had been a smart watch designer, I would understand the temptation to create a freeze-dried version of the screens we all know so well: shrink down the familiar smartphone display, turn it sideways, and add a wrist strap. But given that Google's Android Wear platform and SDK support both round and rectangular watch form factors, I have to wonder which shape will lead the market. While the popular wearables to date such as Samsung's Galaxy Gear and Pebble's Smartwatch are rectangular, I have to say that the retro round-styled watches do look like the could catch on. I've been pretty cynical about a real market for these gadgets in general, but I'm starting to see something here. Please check the videos below for devices from Motorola and a company called Kairos. 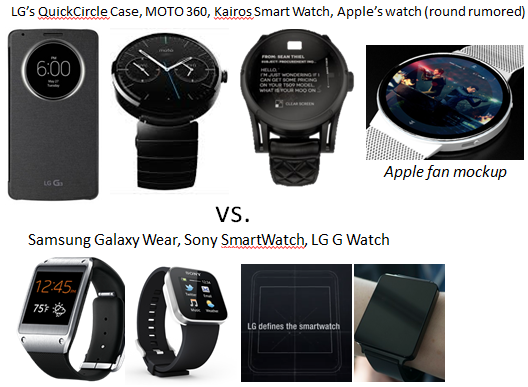 So, will the MOTO 360 become the RAZR of the smart watch world or will it be hip to be square? Only time will tell. The PEV Market: In Norway vs. Sweden, Norway wins 10 to 0.65. Congratulations to Norway on its bicentennial. And as Norwegians celebrate the 200th anniversary of their constitution, they have another reason to be proud: this year Norway will be become the first country in which more than 10% of new car sales will be plug-in electrics during a full calendar year. This is an an amazing stat, especially for an oil-producing nation. Let's compare Norway's adoption of e-cars to its neighboring nation of Sweden. Norway and Sweden are two countries of a similar shape and size. Similar cultures, languages, and tax systems. Two well-off countries with comparable infrastructures and reasonably comparable income levels. Yes, one has oil. But the other has IKEA. Let's call it a wash. In a new market report Research Capsule is publishing entitled "PEVs, there's no turning back now," ReCap forecasts that while more than 10% of new cars sold in Norway during 2014 will be PEVs, only 0.65% of new cars sold in Sweden will be plug-ins (this includes PHEVs as well as full battery-electrics). Countries which penalize car buyers with chunky fiscal disincentives to buy and own larger, heavier cars have the opportunity to encourage quick adoption of PEVs by reducing or eliminating those punitive damages. But many countries tax electric cars in essentially the same manner as internal combustion vehicles. Not Norway. Norway has eliminated many of the taxes and registration fees on PEVs, and also has created a great charging infrastructure for electrics. In addition, PEVs can park for free in many places and also use the bus lanes. These incentives have enabled Norway to become the world leader in the adoption of electric cars, and are the reason Tesla chose Norway as one of its first new markets outside of the U.S. Looking across Norway's border, we see a vastly different market. In Sweden, we estimate less than 1,800 plug-in cars will be sold this year, or less than 0.65% of all new car sales. Any Swedish car buyer who does the math will find that there is no financial incentive to buy electric. Some cynical Swedes we've spoken with say that Sweden won't offer the same level of tax incentives as Norway until semi-Swedish Volvo becomes a real competitor in the PEV market. Why give sales away to Japanese Nissan? It's an interesting thought, though Volvo does have some plug-in hybrids. Let's call this the Scandinavian Contrast. Norway v Sweden. But soon many of the Norwegian fiscal incentives are set to expire meaning Norway itself will be the perfect Petri dish for observing an e-car culture. 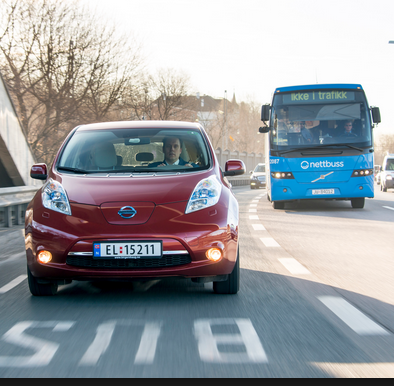 In the race to PEV adoption, will Norway's lead be frozen in time? 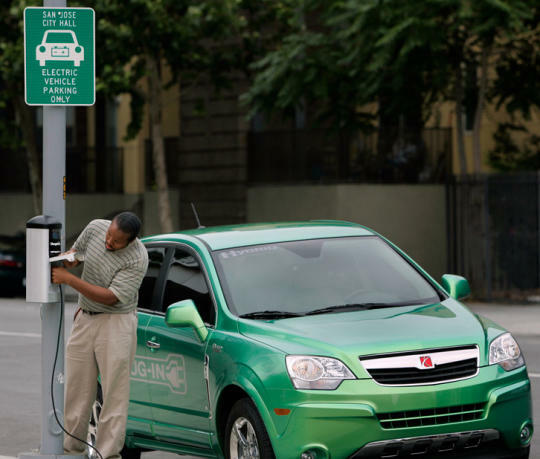 Drivers of electric cars can use the bus lanes. The Mini Mi? NO! It's Mi to the MAX. The Mi Pad $240 tablet. I'm telling you, it won't be easy beating Mi, so remember Mi name. Get to know Mi. And companies like Mi. They are the danger. Good devices, good prices, new pronounceable branding tactics. They have the chemistry in place to change the market for good. Get ready. We are entering the next stage of the wireless business cycle. It's here. It's now. Work with it. Look for opportunities in adjacent markets. Content, services, the connection of things. 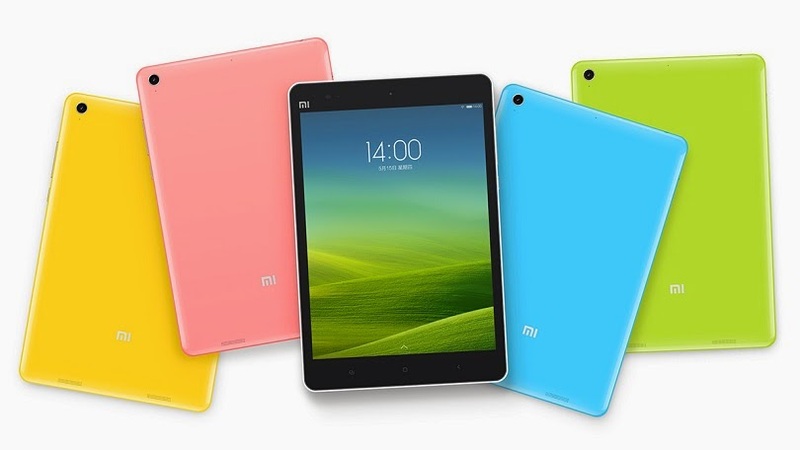 So, please do check out the new Xiaomi Mi Pad (Gigaom story), a very decently spec'd up tablet from the Chinese vendor. The Mi Pad has a 7.9-inch screen with 2,048-by-1,536 pixels, runs on an Nvidia Tegra K1 2.2 processor, has 2GB of RAM, an 8-megapixel rear camera, a 5-megapixel front camera, and a microSD slot. All this for $240 for the 16GB version. The tablet will be available in China this summer and I suspect other markets could follow. Xiaomi (sort of pronounced “show me”) isn't a company looking to scrape some barnacles off of the side of the market. They are aiming for the top. Xiaomi's CEO, Lei Ju, said they “hope to put pressure on Apple.” Xiaomi is a company talking about bringing quality $50 smartphones to the masses. This is a company that is working its way global by spreading out across Asia. So Apple, Microsoft, Samsung, Sony, others, please do remember Mi name. No, you haven't heard the last of Mi. The $240 quality-spec'd Mi tablet. Device prices are coming down, and a receding tide lowers prices for everyone. Is this the smart watch UI of the future? The Wrist Twist? Tongue in Cheek: Is honesty the best business policy? Nothing like a good allegory to get the business thoughts flowing for the weekend. Forget the rose-colored glasses. You're a realist. You see things with clarity and refuse to be deluded by hype. Your colleagues are practically married to their business ideas, but you speak your mind, hurt feelings be damned. So, in the business world, does it pay to forthright, candid, even blunt to the point of pain? Or is it best to sit down and shut up? It's not easy knowing which is best.